Silly interview with Darusha Wehm, pink-haired sailor. Darusha Wehm is a Canadian-born New Zealander who spent YEARS SAILING THE PACIFIC, which is pretty freaking cool. She’s got several novels out, a number of short stories, and she also publishes mainstream fiction (without the ‘m’ in her name). Darusha was kind enough to consent to a silly interview, in which I bugged her a lot about the YEARS SAILING THE PACIFIC thing, because, as I mentioned, freaking cool. 1) I’m always intrigued by authors’ diverse histories, especially the ones that sound like they could be from adventure novels. You spent a few years traveling at sea. What was the most surprising thing about living on the water? I suspect people expect an answer about wildlife or weather or self-sufficiency, and I certainly did learn plenty of interesting things about those aspects of my journey. But for me, the most surprising thing about my time sailing was the incredible sense of community among the other people I met along the way. Other sailors and many locals are incredibly free with their time, fuel and supplies when someone needs help. It’s as if everyone is that best friend who drops everything on their only day off to come help you with a project gone wrong that you should probably never have attempted in the first place. I’ve seen people risk their lives to help a boater in trouble who they’ve never even met. It’s like we are a small town, the exact population of which is constantly changing as boats move to different places. But in every port and every anchorage your neighbours are there, ready to have an improptu potluck party. You might never have met these particular neighbours before, but that doesn’t matter. You’re all still a part of the community. 2) You write and edit crime/mystery fiction as well as science fiction and fantasy. What appeals to you about mysteries? I like puzzles. I also love stories that are about the intimate problems of ordinary people’s lives. Many mystery and crime stories have both of those elements, which draw me to them. Also, I like reading about how people deal with situations where bad things happen. To me, fiction can be a way to test drive another life, another set of possible choices, and seeing the extreme ends of those choices helps me calibrate my own moral compass. 3) Would you write, or have you written, a mystery novel about a character traveling at sea? When I was travelling, people often asked if I was going to write about sailing and I always said no. I was too caught up the in the everyday life to see the possibilities for fiction. But now that I’m a land person again, I’ve started a series that revolves around a sailing crew travelling the world. It’s not a mystery, but who knows what I might write in the future. After living on a boat for seven years, I can tell you that the most common mystery aboard is, “What’s that noise?” I’m not sure how well that would translate to written fiction. 4) I’ve only been to the North Island, but everything I’ve seen in New Zealand is gorgeous. Why did you decide to settle in Wellington? What didn’t you expect about living there? Even though I was born and raised in Canada, Wellington is my mother’s hometown, and she always spoke of it with great fondness. It’s the seat of government here, so had a lot of job opportunities for my partner and as one of those artsy, small cities, has a great culture scene which worked well for us both. Plus, it’s absolutley stunning (when it isn’t blowing a gale). The most surprising thing to me about Wellington is how at home I feel here. I lived on the boat for the first few years I was here, and since the boat was my home, everywhere I was when I was on it felt at least somewhat familiar. But Wellington, wonderful as it is, is a terrible place to live on a boat — it is, by many measures, the windiest city in the world. Once I moved ashore, I expected to feel more alien here, but I don’t. I am an obvious immigrant with my noticiable accent, and small talk with new people always involves the question, “Where are you from?” However, I feel completely comfortable here and have developed a strange attachment to this little city. 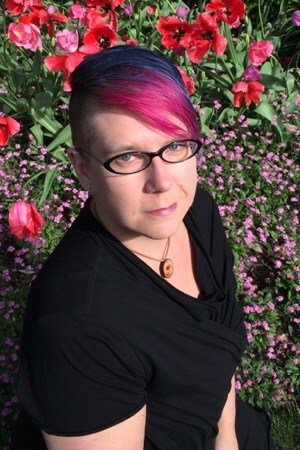 5) You have beautiful purple and magenta hair in your author photo. Do you still have it? Thank you and I do! I’ve had lots of hair colours and styles over the years and I think this is my favourite. 6) Any upcoming projects or events you’d like to share? Devi Jones is a year away from graduating with a Computer Science degree and it’s internship time. But usually the ship part isn’t quite so literal. She gets hired by Really Remote Desktop, a cloud data storage company that keeps their servers in odd places, like the bilge of a hundred-foot sailboat. How can a homebody like Devi step on to a boat with six strangers and sail away from everything she has ever known? All while trying to do her best at her first real job? Being in a tropical paradise helps — but only until things start to go wrong.